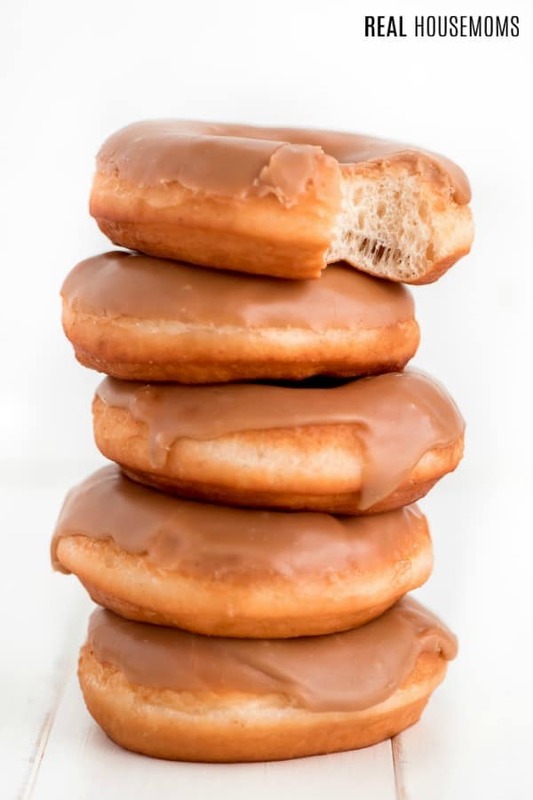 Maple Donuts are THE donut of the season! These soft yeast donuts are light & airy with a perfectly golden crust and a silky sweet maple frosting! I have a confession. Well maybe not a confession, but a fact about myself I’ve come to embrace. I love donuts! 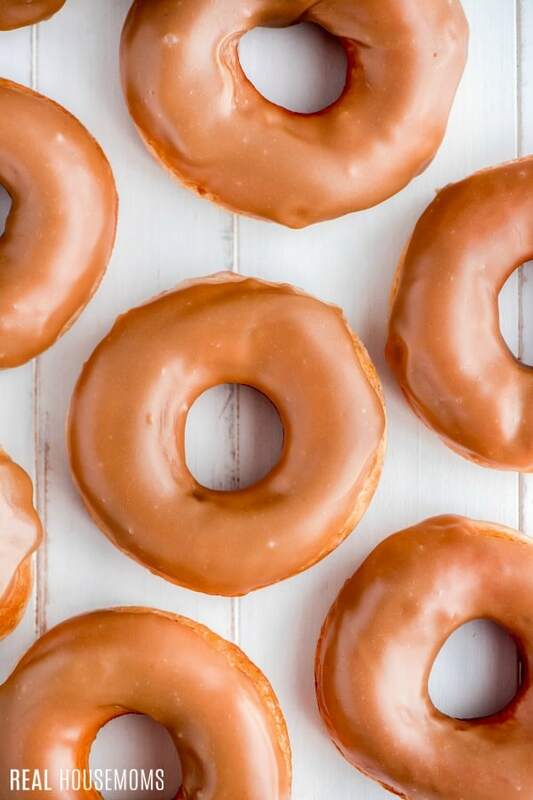 It doesn’t matter if their yeast donuts, crullers, cake donuts, or bars, I love them all. We even celebrate birthdays are our house with a donut “cake” to start the day. 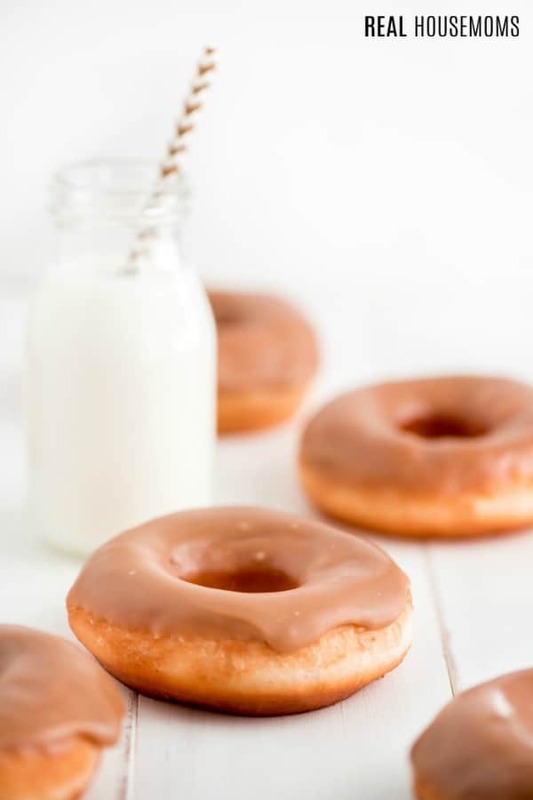 As nice as it is to run down to the local donut shop and pick out our favorite flavors, you’d be surprised to learn homemade donuts are actually really easy to make. Like fruit pizza easy and that’s a recipe ANYONE can make! 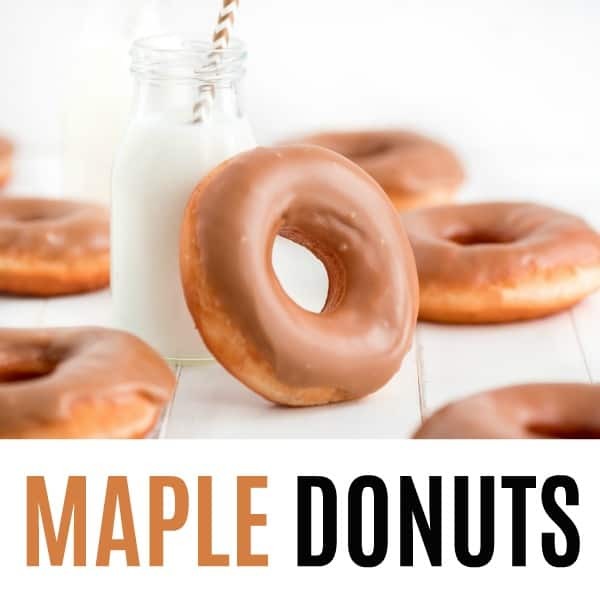 These Maple Donuts are our new easy homemade donut favorite and they are oh so perfect for Fall. I’m a sucker for anything covered in maple like Maple Glazed Pork Tenderloin and Overnight Apple French Toast Casserole. The sweetness and depth of flavor is hard to beat and can be used on everything from pancakes to meats to desserts. Does it seem daunting to make your own homemade donut recipe? I know I was nervous about it but it’s actually quite easy and fried donuts taste way better than baked. Plus, since you’re making them yourself at home, you get to enjoy them hot and fresh which is the absolute best time to eat a donut. The first step is to mix all the dry ingredients together and then add in the liquid. You can do this by hand but a stand mixer fitted with the hook attachment is so much easier. Once the ingredients are mixed together you’ll let the dough rest for 8 minutes and then turn the mixer back on and knead for 5 minutes until a soft dough forms. You’ll then place the dough in a greased bowl and then flip it so the top of the dough is oiled. Cover the bowl with a lid or towel and give it 1 1/2 to 2 hours to rise double in size. Once risen, roll the dough out on a lightly floured surface. Cut out the donuts using a 2 1/2 to 3-inch biscuit cutter and then a 1-inch cutter to cut out the center. Be sure to take the scraps, knead them together and repeat the process until there’s not enough dough to make any more. Place rounds of dough on a parchment lined surface, lightly cover with plastic wrap and let it rise 30-60 minutes. The next step is to fry the dough. Heat the oil to 350 degrees in a large pot. Gently place 3-4 rounds of dough in the oil and cook 40-60 seconds until golden and then flip and cook another 30-40 seconds until golden. Remove and let drain on a paper towel-lined pan. Once they’re cool enough to handle you can dip them in the yummy maple frosting. The frosting is so simple but made different than your typical frosting because you need it to form a dry crust but is still soft and silky smooth underneath. Instead of grabbing a mixing bowl, take out a small saucepan and melt the butter with brown sugar, half & half, and corn syrup. The corn syrup helps prevent sugar crystals from forming. Once the sugar has dissolved you whisk in the maple extract, a little salt, and powdered sugar. It will be thin but you’ll find that after about 1-2 minutes it will start to dry so you’ll need to give the frosting a stir before dipping each donut in. If it starts to get too thick to work with, add a teaspoon of half & half and place it over low heat until smooth and thin again. 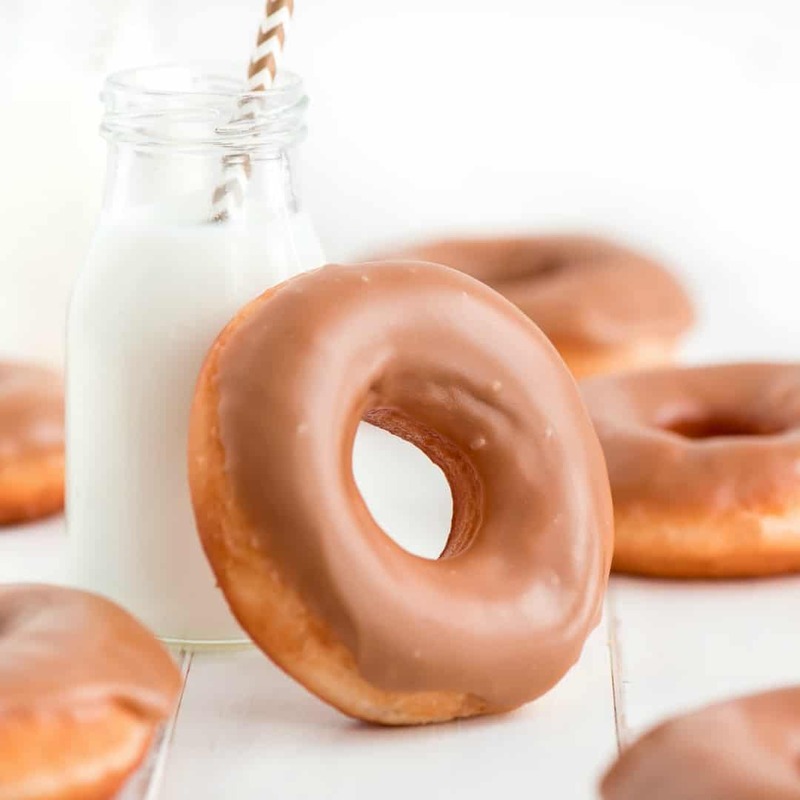 Your family is going to go crazy over this donut recipe. Have the kids help you make and roll out the dough and then enjoy the hot homemade donuts together. Can’t get enough donuts? Me either! These are some of my favorite recipes!! Biscuit Cutter: These biscuit cutters are great! The plastic handles and 3 different size options make sure I get the perfect biscuits every time! Mix dry ingredients together in the bowl of a stand mixer fitted with the hook attachment. Add the liquid ingredients and mix until well combined. Cover with a towel and let it rest for 8 minutes. Knead the dough on medium speed for about 5 minutes until a soft smooth dough forms. Place dough in a greased bowl and then turn it so the top of the dough is wet with oil. Cover the bowl with a lid or towel and let rise for 1 1/2 to 2 hours or until double in bulk. Punch the dough down and empty onto a floured surface and roll out to about 1/3 inch thick and use a biscuit cutter 2 1/2 to 3 inches wide to cut out donuts. Knead scraps together and roll out again and cut until no longer enough dough. Place on parchment lined baking sheets, cover lightly with plastic wrap, and let rise for 30-60 minutes until almost double in size. Pour oil in a pot until 2 inches deep and heat over medium until 350 degrees F. Fry dough, about 3 at a time until golden and then flip. Should take 30-60 seconds per side. Drain on a paper towel lined baking sheet. Once cooled enough to handle, dip the most rounded side of the donut in the frosting and then set on cooling rack. In a small saucepan, heat butter, brown sugar, half & half, and corn syrup over medium heat until sugar is dissolved, Turn to low and whisk in maple extract, salt, and 1/2 cup powdered sugar at a time until smooth. Remove from heat. The frosting does start to dry and harden which is what you want but just give it a quick stir before you dip each donut. If it starts to get too thick, set the pan back over low heat and whisk in a teaspoon more of half & half.